With EGEE09 around the corner, many of you coming next week to Barcelona will be already preparing the luggage. May be you even bought a travel guide and are carefully planning places to visit in the city. For those of you who did not go so far, I can try and give you some recommendation on how to spend your free time in Barcelona. First of all, a small warning about the weather: this is a great time to come to Barcelona, since the burning summer temperatures are gone (two weeks ago, actually). However, short-but-heavy rains are not rare these days. They normally come in the afternoon and last for less than 1h, but if they catch you in the street you will have to go back to the hotel to change your clothes for dinner. So: a small umbrella is not a bad idea. You must know that September 24th we celebrate "la Mercè", which is the "festa major" (annual festival) of the city. During the whole week there will be plenty of music, traditional exhibitions, etc. And plenty of people in the streets from thursday on, for sure. The program is on the web (unfortunately, the english version is minimalistic). Among the dozens of activities, I can not resist to recommend you one: for those of you staying the weekend, on Sunday 27th at noon in the "Plaça Sant Jaume" there will be the "Castells", a human towers competition. This is a Catalan tradition, interesting to show that there is something beyond bullfights and flamenco in Spain. For those of you who have never been in the city, something you must do is to walk around the "barri Gòtic". This is the old town, where you will clearly recognise the cardus/decumanus structure of the old Roman city. 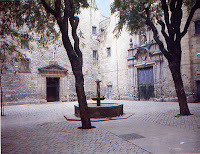 There is plenty of interesting sites there, but please try to find "Plaça Sant Felip Neri" (picture in this post). A normally quiet corner in this busy place, with a special atmosphere. Another nice area to get lost walking the narrow streets is "el Born". There you will find the impressive Gothic church "Santa Maria del Mar" (may be less famous but much nicer than the Cathedral). Also the Picasso museum is in the area, a nice option if it starts raining. In these two areas, "el Gòtic" and "el Born" there is plenty of nice restaurants or tapas bars. A rule that normally works is try to avoid those with the menu in english or looking just for tourists (paella pictures at the door are normally an indication: run!). A nice tapas bar I can recommend for instance is "Txacolin", facing the "Estació de França". This is more typical from the Basque country than Catalonia, but they are really good. For those of you a bit tired of packs of tourists in the streets, you can go for a walk to the "barri de Gràcia" (metro stop Fontana, green line). This is a nice neighbourhood with plenty of nice and lively squares and cafés. A good option if you are interested in shopping, with quite a lot of local designers stuff. You will find plenty of nice restaurants there. If you are a bit tired of tapas and local food, you can give a try to really good iraqian dishes at "Mesopotamia", in the Verdi street. I did not mention all the modernist architecture since I know you are all aware that this is the major attraction of the city and will do it anyway (still, if you want some guidance this web can be helpful). I think it is time to finish my post... though you can imagine there is still a lot to see in Barcelona. If you have still some time, you will find plenty of details in this web page. Have fun, and enjoy Barcelona. Incredible post, Gonzalo!!! After reading this, I think all tourism websites become obsolete :-). I would remark the parallelism between building Computer Clusters in EGEE and... building Human Clusters in the Castell tradition! Mmmmm, sounds delicious! Who wants to go to Mesopotamia some night?